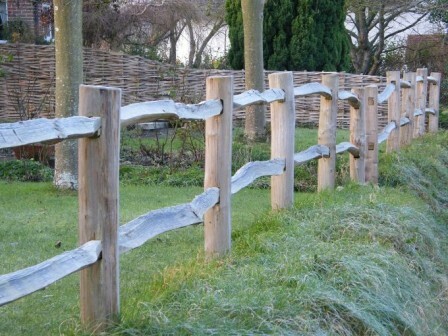 Chestnut and oak are most favoured for post and rail fencing due to its natural resistance to rotting. Cleft posts and rails look attractive and unique by following the natural grain of the wood. Posts and rails may be sawn or a combination of sawn posts and cleft rails may be preferred. Posts are normally mortised to receive the rails to create a strong and attractive fence but a cheaper alternative is to nail the rails to the posts which normally need to be sawn. Using 2 or 3 rails is most common but more can be used depending on the fences purpose. Rails can be supplied at different lengths commonly between 6 – 10 ft long.